When the shadow of a rainstorm has passed and we are able to witness a rainbow illuminating our corner of the world, the most common association of this phenomenon in the Judeo-Christian tradition is with the legend of Noah’s Ark. Schoolchildren are routinely taught that a rainbow symbolizes divine forgiveness for human global corruption and the divine promise to never allow another cataclysmic flood to wipe out nearly all of the life on this planet. Since that anti-diluvian era, every culture has created their own idea of the rainbow, endowing it with backstories and attributes that range from magical to mundane. Scholars, musicians, artists and poets have made much of those characteristics as have social activists, employing rainbow colors to promote their agendas of social change through racial, gender and sexual equality. As I considered how to illustrate the idea of a rainbow for this blessing, I recalled a wonderful tertiary (triple) rainbow that I had seen over the east end of Pittsburgh in the late 1990’s. Its three overlapping arches stretched from Squirrel Hill to perhaps somewhere beyond the North Hills, but of course that endpoint remains a mystery. Regretfully, that was before the convenience of iPhone cameras that could easily record it. Nevertheless, I still remember that it appeared in a sky of an unusual grey-green color which made it seem so much brighter. Suspended in the majesty of that moment, I didn’t care that science views the colors of the rainbow as wavelengths of light traveling at particular frequencies or that their visibility depends on our vantage point relative to the sun’s position and the presence of sufficient raindrops to refract and reflect its light. Even Sir Isaac Newton’s decision in 1672 to divide the spectrum into seven colors seemed frivolous, especially since it was based on the ancient Greek philosophy positing a connection between the colors, the musical notes, the days of the week and the seven planets in our solar system that were known at the time. From my perspective, that rainbow just seemed too magical for such mundane explanations. And so I began to look into the more subtle interpretations that have found their way into our collective understanding; which made thinking about rainbows in terms of Kabbalah, or Jewish mysticism more appealing. I understood these comments as warnings to remain humble in the presence of holiness which further readings alluded to the presence of Shekhinah or the feminine aspect of the Divine. She is the accessible intermediary for Its sefirot** whose many symbolic attributes include their colors which correspond to our perception of the rainbow. Then there were often fanciful folktales stemming from commentaries on the Book of Genesis whose narratives were both cautionary and poetic. Louis Ginsberg, in his Legends of the Bible, lists the rainbow as one of the ten extraordinary things*** that came into being in the twilight of Creation, although it was not meant to be seen until the time of Noah when the dual concepts of justice and mercy were introduced as the Divine remedy for transgression and repentance. Such stories suggested to me that the Torah is in itself a rainbow whose colors reflect our spiritual character and mandate, and second, that we, as imaginative creatures, ever curious about who and why we are, can assign whatever significance we wish to any of the natural phenomena that occur on this planet. On the tail of these thoughts, the image of a tallit flashed in my mind’s eye. I recalled from my studies that the tallit, worn during prayer is often compared to Divine wings which protect us via G-d’s love and commandments. Also, in Jewish tradition a bird is the metaphor of the Shekhinah who comforts and protects Israel during the centuries of exile. Though I do not yet wear one, I liked the idea of being wrapped in a tallit to evoke Shekhinah since it lends credence to the recognition of the sacred feminine. I then began to wonder about the stripes of a tallit, or prayer shawl and whether they might serve as a rainbow metaphor, even though they are traditionally black in color. As an artist, I knew that theoretically, the color black contains all the colors, so it wasn’t much of a stretch. But then, I came upon a story that Rabbi Zalman Schacter- Shalomi tells in his book, My Life In Jewish Renewal (Rowman & Littlefield, September, 2012) when he explains the significance of his specially made rainbow tallit. His intention was to wear a physical meme as a reminder of Creation and complexity of our world in the light of G -d’s unity. Eventually, these concepts and my memory of that tertiary rainbow crystallized in my imagination and led to the imagery which accompanies this blessing for the rainbow. And so, I decided the Shekhinah would be the focus of my illustration. Although I have often interpreted her in my works, the potential iterations for doing so are limited only by imagination. 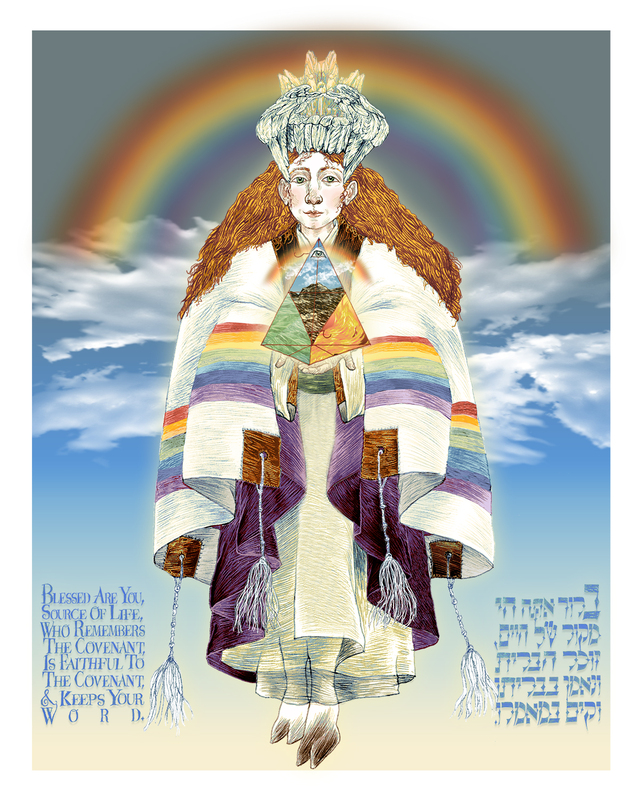 Here she is wearing a crown of feathers (to mirror the bird metaphor) and is embraced by her rainbow tallit. Its colors symbolize the days of Creation. My Shekhinah also balances a crystal revealing the four elements (air, earth, fire and water) to represent the constant physical manifestations of Creation under divine auspices. Her cloven-hoofed ‘feet’ are a fanciful interpretation that is also drawn from Ezekiel’s vision. If what we imagine gives us comfort, fosters doubt or amuses us, we can also learn how important it is to keep wondering and embellishing these ideas for generations to come. Also, if you visit my Kickstarter page at: http://www.kickstarter.com/projects/1330347473/an-illumination-of-blessings you will see that the top reward level of your $500 contribution towards this project entitles you to have your name included on my Dedication page! This offer will stand until July 15, 2014 when I hope to have the book ready to go to press! You may contact me with your offer at: ilene@winnlederer.com. On average, we spare little daily thought for the sun other than to its perceived influence on the esthetics of the next twenty-four hours. It is, therefore, we are. End of story. But since the sun’s first appearance in the skies on the fourth day of Creation, according to the Torah (Book of Bereshis/Genesis), this story is not one with an ending; it is punctuated with the myths and folklore of every human culture from the beginning of recorded time and perpetuated across generations in forms apropos to each telling. These tales comprise a portion of the collective effort to comprehend our origins amidst our mercurial environment, the relentless cycle of the seasons and our place in the cosmos. They are an amalgam of sincere theological speculation, intriguing scientific discovery with some millennial fear-mongering thrown in for spice. 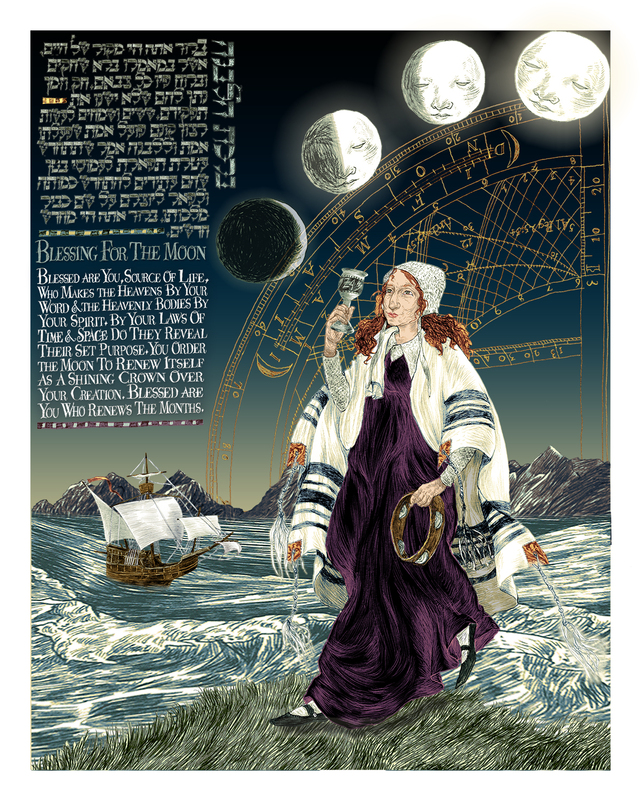 In tribute to this timeless portrait of human curiosity, I’ve chosen to include a rare Jewish blessing for witnessing natural phenomena in my book, An Illumination Of Blessings. 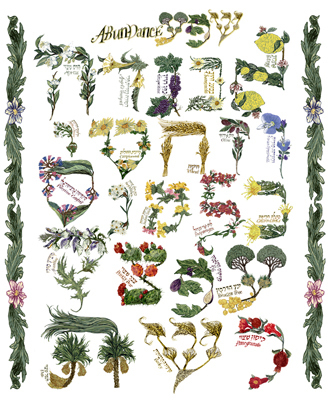 The Birkat Ha-Chamah or Blessing of the Sun is rare because it is recited only once every twenty-eight years, most recently in April of 2009. It is not to be found in standard prayer books; rather, it is distributed to participants at each recitation ceremony. The blessing dates back to Talmudic times (first century AD) when the rabbis, wishing to acknowledge the sun’s importance to life on Earth without inviting idolatry, addressed the star theologically without attributing divinity to it. 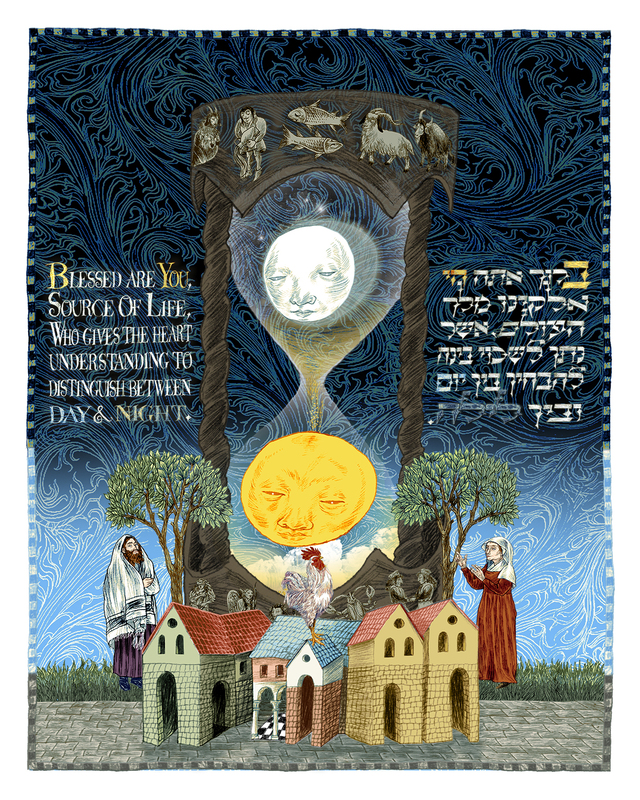 My illustration for this blessing is set in medieval Europe when rabbi-scholars like Maimonides (the Rambam) and Samuel ben Judah ibn Tibbon engaged in lively discussions of Torah and Talmud, codifying their opinions for future generations. 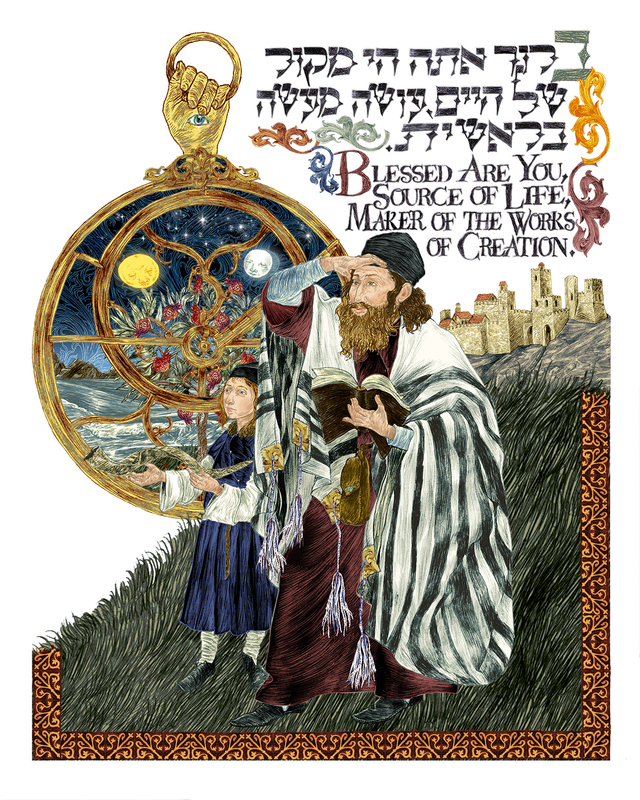 On a grassy hillside against the backdrop of a castle fortress-town, a prayer shawl (tallit) clad man and his son are awaiting the full sunrise as they imagine a vignette of the fourth day of Creation framed within an astrolabe. The hand-shaped (hamsa) device from which the astrolabe is suspended is meant to represent the idea that its five fingers remind us to use our five senses to praise G-d. The hamsa is also referred to as the Hand of Miriam in remembrance of her as sister to Moses and Aaron. ** The boy holds a ram’s horn (shofar), which will be sounded when the sun has risen. 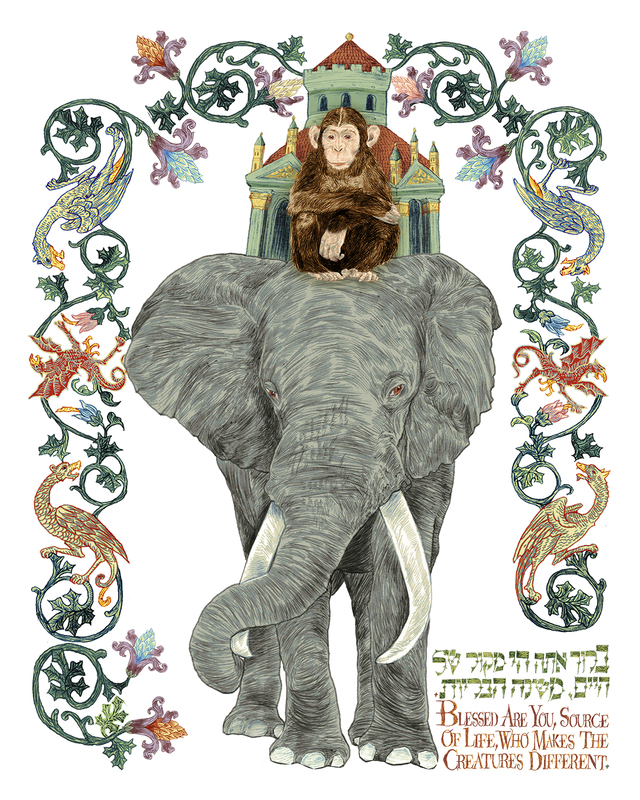 This image was suggested by the Birkat Ha-Chamah ceremony of April 8, 1981, led by Rabbi Zalman Schachter-Shalomi who stood on the observation deck of the Empire State Building in New York and sounded the shofar amidst a crowd of 300 participants. I think, perhaps, this is how we might understand our place in the cosmos. As witnesses to the wonders of created life, that is a dance of chaos and order, we are privileged to question it, but are never to know all the answers or the end of the story; at least, not yet. * Why every twenty-eight years? Although the sun rises and sets in the east and west respectively, its position shifts seasonally, moving to the north in summer and to the south in winter. The midpoints of this movement are the equinoxes which mark the autumn and spring seasons. To complete this cycle requires one solar year, the length of which varies by slightly more than a day in our calendar. So the rabbis calculated that when the equinoxes have moved forward exactly thirty-five days, they will occur on the same day and hour as on the first hour of the fourth day of Creation. ** Some of you may wonder why I have not included a woman in this ceremony. This is because the Birkat Ha-Chamah is a time-based mitzvah (commandment) which women are exempt from observing. 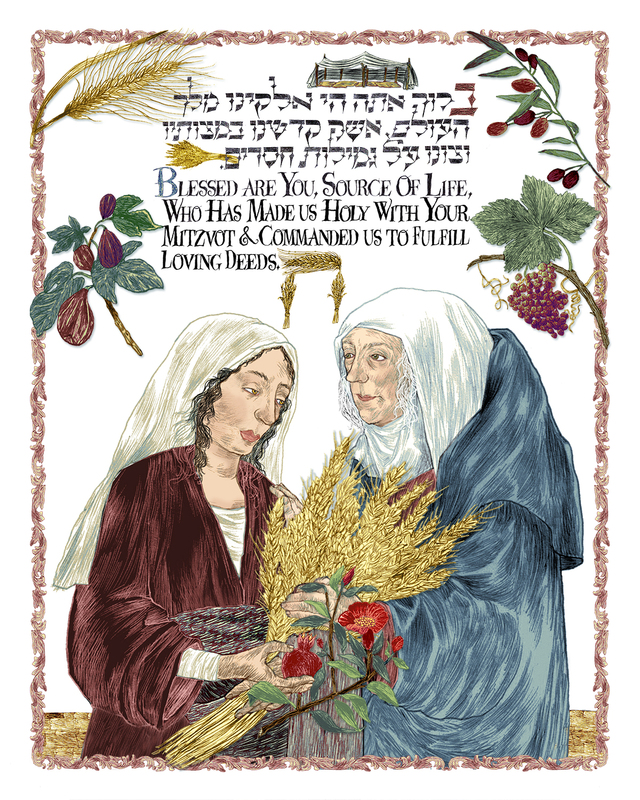 You can read more about this tradition here: https://www.jewishvirtuallibrary.org/jsource/Judaism/woman_commandments.html Nevertheless, the Hand of Miriam attached to the astrolabe represents their spiritual presence. Ordinarily, I like to deny subscribing to coincidence, but I must stand corrected on account of this week’s installment from An Illumination Of Blessings. Anyone of middle-age and beyond will readily admit that as we age, time seems to pass more quickly, yet we only recognize that deceptive phenomenon in retrospect. Last week, when I chose to begin work on this blessing for the wisdom to distinguish day from night it did not immediately occur to me that coincidentally, we were about to begin the ‘spring ahead and fall behind’ cycle for one hour semi-annually in the parlance of daylight saving time. Today, it began around 2AM this morning and though I can always feel the transition instinctually, the fact of it never fails to take me by surprise. This tradition began centuries ago as an informal observance of the Earth’s rotation in relation to the effects of the sun and moon cycles on agriculture, lifestyle and human productivity. It became progressively codified and enforced well into the twentieth century but today, there are groups advocating for its eradication in the interest of simplifying travel, scheduling, commerce and environmental conservation. The latter justification is ironic considering that daylight saving time was initially instituted as an energy saving measure! However, since daylight saving time may have derived from our ability to distinguish and contemplate the differences between day and night, it is only marginally related to today’s blessing essay. So to learn more about it, you can find a detailed history of daylight saving time and the arguments against it at: Wikipedia: http://en.wikipedia.org/wiki/Daylight_saving_time and at: http://www.standardtime.com/proposal.html. “Although a rooster crows at the beginning of each day it actually happens some time before it gets light. When it senses that dawn will break soon, and light is on the way to substitute for the darkness, he emits the crowing noise that became the ancient alarm clock. In addition to the rooster, the other elements in my illustration are arranged around a sort of cosmic hourglass. Suspended within their separate spheres, our sun and moon are poised to reverse their positions in a dance designed at the time of Creation. I wanted to symbolize our understanding of these celestial bodies with regard to our environment and our lives (trees and houses) by placing them within a man-made timekeeping device. The sprinkle of stars that inspired the signs of the Zodiac on the hourglass are there to remind us that while our acquired knowledge is of great value, the light of that value darkens without the wonder and faith that guide it. The arrival of a new baby universally inspires joyful celebrations for the parents and community with festivities unique to every ethnicity and religion. In addition to an array of rituals and special foods, these festivities are marked by prayers and blessings offered to The Source of Life for the divine protection, good health and honor of this child. Nevertheless, I determined that in addition to the sleeping newborn child and colorful daffodils (which signify rebirth and new beginnings), I would limit my choice of iconography to the wimpel (or vimpel). This is a banner-like length of cloth that is wrapped and tied to secure the Torah scroll. According to Philologos writing in the Jewish Daily Forward, “it is a tradition that began in late medieval times in the Rhineland city of Mainz, where the rabbi was then the renowned Ya’akov Segal (1360–1427). One Sabbath, so the story goes, a circumcision was under way in Mainz’s synagogue, when it was discovered that the mohel (an individual especially trained to perform this ritual)had forgotten to bring a diaper in which to wrap the newly circumcised child. Inasmuch as carrying was forbidden to pious Jews on the Sabbath, there could be no question of sending anyone to fetch one — and so the rabbi ordered the child swaddled in an avnet that was removed from a Torah scroll. Afterward, when asked if it could be laundered and used as an avnet again, he ruled that it could be, inasmuch as it had not been profaned but had merely gone from one sacred use to another. 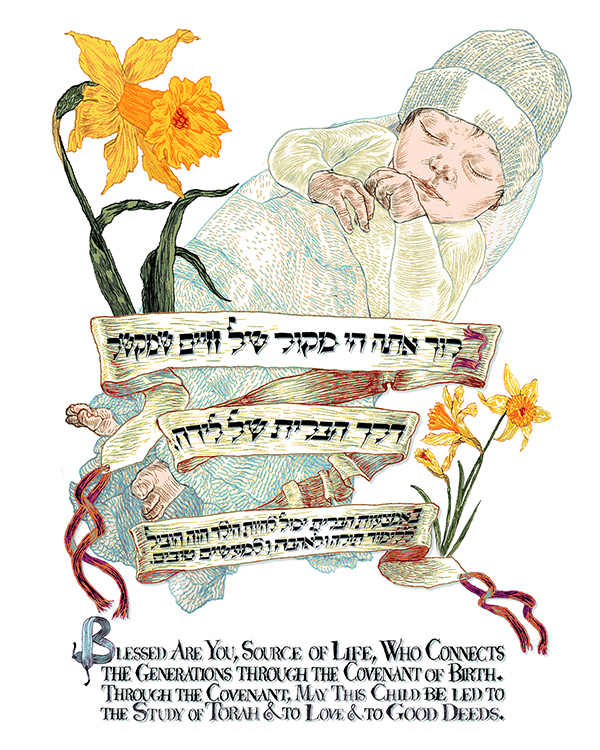 In memory of the event, the Jews of Mainz took to donating the swaddling cloths from their circumcisions for avnetim, which they called Wimpel (the German plural is the same as the singular).” Instead of the customary decorative imagery applied to wimpels by families who donate them to the synagogue, mine simply displays two Hebrew prayers, one traditional and one modern. Independent of its ethnicity or religious identity, the birth of a child begins a new page in the story of humanity. With this child, we have a new window into the mind and heart of the One whose children we will always be and Who will always cherish us.